The Russo Brothers assembled at least some of the Avengers: Endgame cast for further reshoots this week. Karen Gillan and Zoe Saldana both posted on social media, with Saldana providing videos of herself in the iconic green Gamora makeup, which could possibly be a spoiler. Is she back from the dead? Or is this just Memorex? It isn't clear if there will be further reshoots or if the directors are finished for the time being. There is now less than 100 days to go until the highly anticipated sequel hits theaters, and Marvel Cinematic Universe fans are beginning to get a bit antsy. Obviously, we have no idea why Gamora and Nebula were needed to get back on the set of Avengers: Endgame, but it could have to do with their father, Thanos. It also isn't clear if other members of the cast were on hand either, but this could have been what the Russo Brothers meant when they said that Chris Evans wasn't finished playing Captain America just yet. 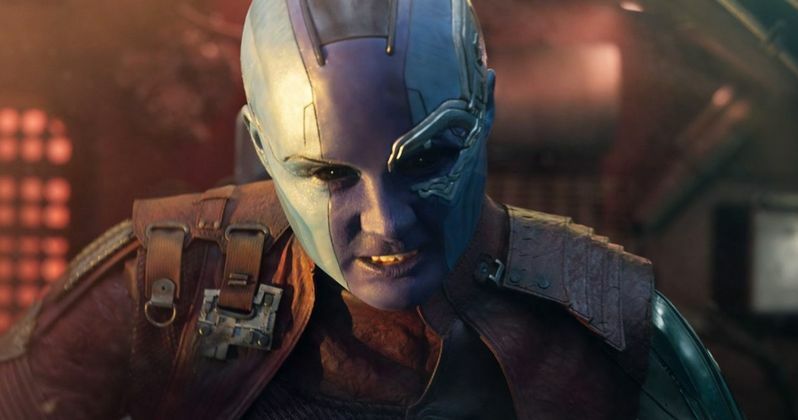 Nebula actress Karen Gillan revealed that she was "washing the blue from her fingernails one more time," which seemed pretty cryptic until Zoe Saldana shared her posts. Zoe Saldana shared a short video of herself with the full Gamora makeup on and then a time-lapse video as she was getting everything removed at the end of shooting. Gamora's inclusion in Avengers: Endgame is a bit of a mystery at the moment since Thanos threw her off of a cliff and killed her in Infinity War. There could be some time travel involved or her scenes could have been used for a flashback effect, we won't know until the movie hits theaters at the end of April. Saldana said, "Adios Gamora... for now at least! Ha." Reshoots are a common practice in the world of big budget Hollywood movies, and the MCU is no different. However, many believed that the reshoots concluded in October of last year. That was obviously not the case for Karen Gillan and Zoe Saldana, and possibly for other cast members too. Nebula is one of the only members of the team that was left standing, but the first trailer for Avengers: Endgame shows that she and Tony Stark are lost in space, waiting for someone, or something to come rescue them. With less than 100 days to go, the Russo Brothers appear to have a lot more work ahead of themselves. Captain Marvel, as of two weeks ago, was still in the editing stage with CGI still being completed. The Carol Danvers movie will be released in 50 days, so it appears that Marvel Studios is into working until the last possible second, which is what the Russos did with last year's Infinity War. There's a lot of buzz surrounding Avengers: Endgame, but there's even more mystery, keeping everyone on their toes. While we wait for some more information, you can check out some behind-the-scenes fun below, provided by Zoe Saldana's Instagram page.